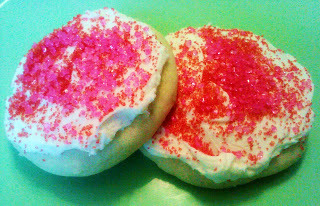 I don't usually like store bought cookies...but those soft doughy sugar cookies with the frosting seem to be an exception. Every kid (and a lot of adults) I know seems to like those cookies. If you like those you will LOVE these. I wanted to make an at home copycat version of those with more natural ingredients. This recipe is easy and really delicious. These cookies are delicious whether they are frosted or plain. These are our new favorite cookie! You MUST bake these cookies on a Silicone Baking Sheet (i.e. Silpat), otherwise they will not stay soft. This keeps the cookies from browning on the bottom. (1) Preheat the oven to 350˚ F.
(2) In a medium bowl mix together the flour, baking powder and salt. (3) In a large bowl, combine the butter and sugar with an electric mixer and beat together approx. 2 minutes with a mixer until soft and fluffy. (4) Beat in the eggs one at a time until mixed well and fluffy. (6) Using your mixer, add in the dry ingredients to the wet ingredients a small amount at a time just until mixed together well. (7) Roll the dough into balls (about golf ball size or a tad larger) and then place them on the cookie sheet lined with a silicon baking liner (i.e. Silpat) about an inch apart. (8) Use your hand to lightly flatten the balls into the shape of a cookie (about a 1/2 inch thick). (8) Bake 10 minutes in the oven. 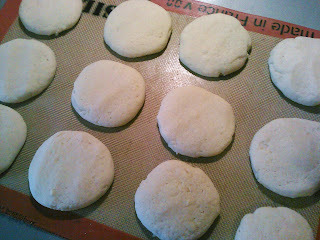 (9) Remove the cookies from the oven, but let them sit on the cookie sheet and continue to cook until cooled. After completely cooled, frost the cookies if desired. I frosted these with this fantastic buttercream frosting http://www.christineiscooking.com/2011/11/buttercream-frosting-oamc.html. Tip: I like to set my eggs out for at least 20 minutes before using them in this recipe - I find they whip up better when they are not right out of the fridge. If they dough becomes too soft to work with - just sit it in the fridge for a few minutes.